Isaac Asimov was a Russian-born, American author, a professor of biochemistry, and a highly successful writer, best known for his works of science fiction and for his popular science books. Professor Asimov is generally considered the most prolific writer of all time, having written or edited more than 500 books and an estimated 90,000 letters and postcards. Asimov is widely considered a master of the science-fiction genre and, along with Robert A. Heinlein and Arthur C. Clarke, was considered one of the “Big Three” science-fiction writers during his lifetime. He also wrote mysteries and fantasy, as well as a great amount of nonfiction. Asimov wrote the Lucky Starr series of juvenile science-fiction novels using the pen name Paul French. Asimov was a long-time member and Vice President of Mensa International but he took more joy in being president of the American Humanist Association. The asteroid 5020 Asimov, the magazine Asimov’s Science Fiction, a Brooklyn, NY elementary school, and two different Isaac Asimov Awards are named in his honor. Empire — (1950-1952) One moment Joseph Schwartz is a happily retired tailor in 1949 Chicago. The next he’s a helpless stranger on Earth during the heyday of the first Galactic Empire. Earth, he soon learns, is a backwater, just a pebble in the sky, despised by all the other 200 million planets of the Empire because its people dare to claim it’s the original home of man. And Earth is poor, with great areas of radioactivity ruining much of its soil — so poor that everyone is sentenced to death at the age of sixty. Joseph Schwartz is sixty-two. 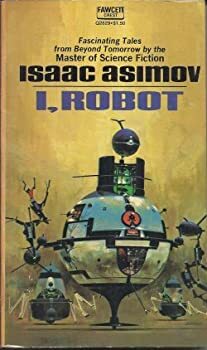 This is young Isaac Asimov’s first novel, full of wonders and ideas, the book that launched the novels of the Galactic Empire, culminating in the Foundation books and novels. It is also one of that select group of SF adventures that since the early 1950s has hooked generations of teenagers on reading science fiction. This is Golden Age SF at its finest. Foundation — (1951-1993) Publisher: When the Galactic Empire began dying, the great psychohist orian Hari Seldon set up the Foundation to preserve human culture & shorten 30,000 yrs. of chaotic barbarism to a mere millennium. Located on a bleak world at the ede of the galaxy, it seemed helpless before the greed of neighboring warlords. But somehow, by science & wit, it had survived & even gained control of a small federation of planets. Yet it was still small. And against it stood the great est power of all — the huge power of the Empire, mighty even in decay. When an ambitious general turned an Imperial fleet toward the Foundation, the only hope lay in the prophecies of Hari Seldon. But even Hari Seldon could not predict the birth & mutant talent of the Mule — one small man w/power greater than a dozen battlefleets. Between big & little, the Foundation seemed doomed. Hari Seldon is remembered for combining principles from psychology and history into “psychohistory,” a discipline that projects humanity’s course for thousands of years into the future. Psychohistory cannot very accurately predict the actions of individuals, but large groups are less random in their behavior. Unfortunately, Seldon’s calculations predict that the Galactic Empire will soon fall—and its dissolution will give way to thousands of years of barbarism. Seldon is not cynical: he turns his attention to manipulating a course of events that will condense the coming Dark Ages and give rise to a reborn empire. Seldon sets up a Foundation on Terminus, and dies hoping that he’s done enough to save the galaxy. Will his gambit succeed? 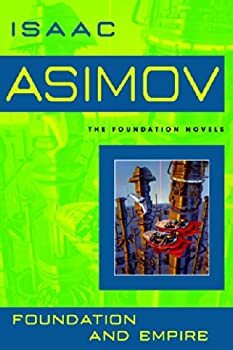 This is the second book in Isaac Asimov’soriginal FOUNDATION trilogy, which later became the FOUNDATION series. 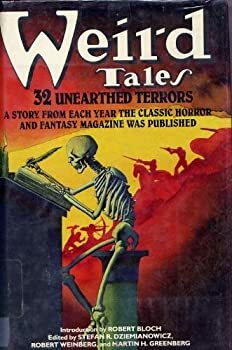 It first came out in book form in 1952, but it originally saw print in the form of two novellas, “Dead Hand” (originally published in Astounding Science Fiction, April, 1945) and “The Mule” (originally published in Astounding Science Fiction in November and December, 1945). ROBOT (R. Daneel Olivaw) — (1954-1985) Publisher: A millennium into the future two advancements have altered the course of human history: the colonization of the galaxy and the creation of the positronic brain. Isaac Asimov’s Robot novels chronicle the unlikely partnership between a New York City detective and a humanoid robot who must learn to work together. Like most people left behind on an over-populated Earth, New York City police detective Elijah Baley had little love for either the arrogant Spacers or their robotic companions. But when a prominent Spacer is murdered under mysterious circumstances, Baley is ordered to the Outer Worlds to help track down the killer. The relationship between Life and his Spacer superiors, who distrusted all Earthmen, was strained from the start. Then he learned that they had assigned him a partner: R. Daneel Olivaw. Worst of all was that the “R” stood for robot–and his positronic partner was made in the image and likeness of the murder victim! In 1966, Isaac Asimov’s first three FOUNDATION novels won a one-time Hugo Award as the “Best All Time Series” for science fiction. While I still think the award was a reasonable (albeit highly subjective) one for the time, I’m becoming more and more convinced that Asimov’s three “Robot/Mystery” novels starring Earthly detective Elijah Bailey and his partner R. Daneel Olivaw (the “R.” stands for Robot, naturally) are better books, and quite possibly would have been a better choice for the award. 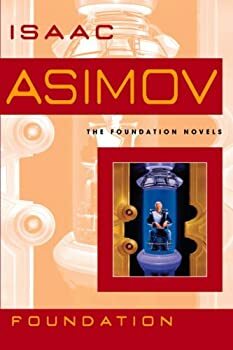 Having just re-read his original FOUNDATION trilogy, I think I’m in a good position to compare it to the ROBOT novels. 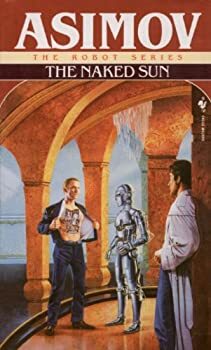 The Naked Sun is the second of Isaac Asimov’s books about police detective Elijah Baley and the humanoid robot R. Daneel Olivaw. 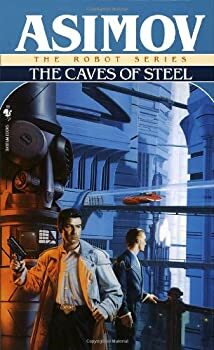 Asimov wrote the first book, Caves of Steel (reviewed by Steven), as the answer to John W. Campbell’s challenge to create a science fiction murder mystery. Asimov succeeded, of course, and chose to give us another installment. You don’t absolutely need to read Caves of Steel before reading The Naked Sun, but it’d probably be a little easier if you did. The Naked Sun takes place a couple of years after the events of Caves of Steel, in some far-future Earth after humans have created and evolved separate cultures by settling other planets. 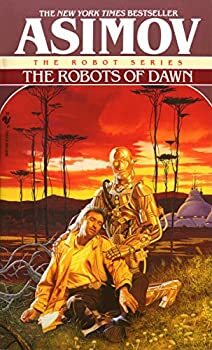 The Robots of Dawn is the third book in Isaac Asimov’s trilogy about investigator Elijah Bailey and his robot sidekick R Daneel Olivaw. In the first book, The Caves of Steel, the pair met and solved a murder mystery on Earth. In this far-future Earth, a fearful populace lives in domed cities and never ventures outside. In the second book, The Naked Sun, Elijah faces his fears and actually leaves Earth to solve a murder that occurred on a planet that has such low population density that the inhabitants have evolved a disgust for their fellow humans. When Elijah returns to Earth, he’s determined to use his new-found courage to inspire others to go outside the domes and even think about leaving Earth someday. He thinks that colonizing other planets is the only way that the human race on Earth can survive. “..all conflicts are finally evitable. Only the Machines, from now on, are inevitable"
Robots must not hurt human beings or allow them to come to harm. Robots must obey human beings so far as it doesn’t violate Law 1. Robots must not harm themselves as long as this doesn’t violate Laws 1 and 2. Re-reading a favorite book from your teenage years is always a risky endeavor. I've been dismayed by how often my youthful memories are tarnished by a re-read, and I end up wondering if my taste as a young adult was all in my mouth. 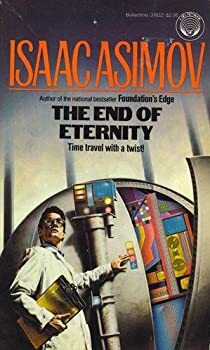 But I couldn't resist trying The End of Eternity (1955) by Isaac Asimov again, partly because I remembered liking it so well as a teenager, but my memories of it were so extremely hazy (for the longest time, until a Google search saved me, I couldn't even remember the title of the book, it was just "that really cool Asimov time-traveling book" in my head). So I bought a used copy, got a few chuckles out of the 1970s sci-fi cover and how short novels used to be (192 pages here), and settled down to read. Nine Tomorrows: You’ll wish there were twenty tomorrows! Isaac Asimov may very well be the most prolific author in modern history. With over 500 books to his credit (506, to be exact... go to asimovonline.com for the full list, if you don't believe me! ), covering just about every subject in the Dewey Decimal System (except philosophy, I believe), the man was a real marvel. One of these 500 volumes, Nine Tomorrows, is a collection of short stories that Doc Ike first had published in various magazines during the period July 1956 to November 1958. 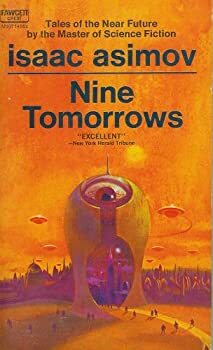 As the title suggests, all nine tales deal with possible futures that may face mankind, and all feature the wit, erudition and clarity that are the hallmarks of every Asimov story/novel that I've ever read. Jan Benes, a brilliant scientist from the Other Side, has knowledge that can deliver America a military advantage. Benes has decided to defect, but when the Americans smuggle Benes into the country, They shoot him. Though Benes survives, an inoperable blood clot threatens to end his life. But wait! There may be a new technology that could allow surgeons to remove the blood clot from inside Benes’ body. Miniaturization is that secret new technology. Controlled by the Combined Miniature Defense Force (CMDF), miniaturization will allow “four men and one woman” in a submarine armed with surgical lasers to enter Benes’ blood stream. From within his arteries, the team hopes to destroy the clot, saving Benes’ life and delivering the Americans the technological advantages Benes has smuggled from the Other Side. 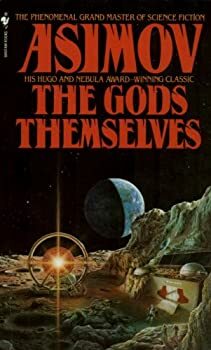 Isaac Asimov’s The Gods Themselves earned the Hugo Award for Best Science Fiction Novel, the Nebula Award for Best Science Fiction Novel, and the Locus Award for Best Science Fiction Novel. About 15 years ago it was put on the Locus list of All Time Best Science Fiction Novels. 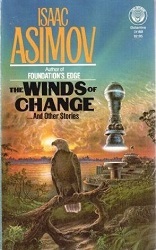 The Winds of Change... and Other Stories is a 1983 collection of Isaac Asimov's latter-day short pieces; just one of the 506 books he came out with during the course of his incredibly prolific career. The 21 stories in this collection were, with two exceptions, written between 1976 and 1982, and all display the clarity of thought, wit and erudition that are the hallmarks of all of Doc Ike's work. Four of the stories in this collection — "About Nothing," "Death of a Foy," How It Happened" and "Sure Thing"— are short shorts, or "vignettes," as Asimov calls them. Most of these are mere setups to terrible puns; puns that do leave a goofy grin on the reader's face, however. 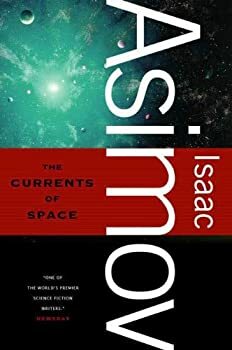 Every time I see a short story collection by Isaac Asimov in audio format, I pick it up because I love his short stories more than I love his novels. 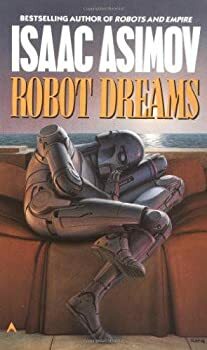 Last year Recorded Books released Robot Dreams, which was originally published in print form in 1986. The audiobook is 14.5 hours long and narrated by the wonderful George Guidall. Lucky Starr — (1952- 1958) Young adult. Publisher: Originally used the pseudonym Paul French. Publisher: David Starr, Space Ranger is the first novel in the Lucky Starr series, six juvenile science fiction novels by Isaac Asimov that originally appeared under the pseudonym Paul French. The novel was written between 10 June and 29 July 1951 and first published by Doubleday & Company in January 1952. 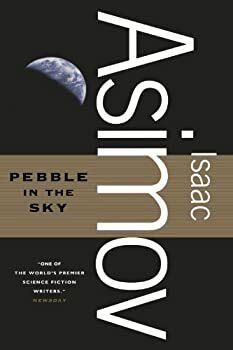 Since 1971, reprints have included an introduction by Asimov explaining that advancing knowledge of conditions on Mars have rendered some of the novel’s descriptions of that world inaccurate. Norby — (1983-1988) With Janet Asimov. Publisher: Norby was originally a robot named the Searcher, created by the robot Mentor First on the planet Jamya. On his initial mission, Norby’s ship crashed in Earth’s asteroid belt and was discovered many years later by a salvager and inventor named McGillicuddy. McGillicuddy welded much of the remaining parts of the Seeker into a steel barrel that originally contained Norb’s Nails, later becoming the basis for Norby’s name. He eventually fell into the possession of a used-robot shop where he was sold to Jefferson Wells, a space cadet looking for a teaching robot. Norby’s body reflects his outer origins as a barrel, while his arms are retractable and have double-sided palms (and two thumbs). His head is round with four eyes, two on each side, and the top is a dome which he can retract into his barrel. His feet are also extendable/retractable. Norby has a tenor voice but can communicate through telepathy by touch. Norby is equipped with a miniature anti-gravity device allowing him to float. He also possesses hyperspace technology, although his choices of locations can be limited to Earth, Jamya, Izz, or somewhere else he has been due to his mixed-up nature. He also has the capability to travel through time via hyperspace. Norby’s many features make him a target for scientists, the army, and the rogue Inventor’s Guild for disassembly and study. The Double Planet — (1960) Publisher: Discusses the smallest, most distant, and most mysterious planet in our solar system, its discovery, its peculiar orbit, and its recently discovered satellite. Fantastic Voyage — (1966) Publisher: Four men and a woman are reduced to a microscopic fraction of their original size, sent in a miniaturized atomic sub through a dying man’s carotid artery to destroy a blood clot in his brain. If they fail, the entire world will be doomed. 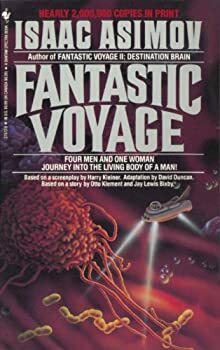 Destination Brain: Fantastic Voyage II — (1987) Publisher’s Weekly: Twenty-one years ago when the movie Fantastic Voyage was released, Asimov was hired to do the novelization. 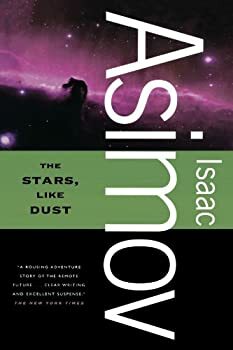 The book was successful but, to Asimov, not satisfying, for “I never felt it to be entirely mine.” Now he has rewritten it his way, and it’s good. The story concerns Albert Jonas Morrison, a 21st century neurophysicist, and otherwise an ordinary and unheroic man, who is kidnapped and taken to the Soviet Union. A major Soviet scientist, Pyotr Shapirov, is in an irreversible coma, and Morrison’s special expertise could be of value. The Soviets believe that Morrison may be able to apply his controversial theories to retrieve vagrant thoughts that still may be floating in Shapirov’s damaged brain and so provide clues to important work in which Shapirov was engaged. Morrison goes cold with fear because the plan calls for him to be miniaturizedalong with four Soviet scientiststo sub-molecular size, introducing them into Shapirov’s body and, ultimately, into his brain. 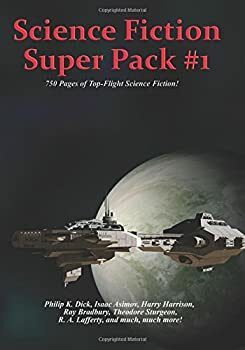 The snappish relationships between the scientists is wryly depicted, and the mission itself makes fascinating reading as both an actionadventure and an intellectually stimulating premise. Nemesis — (1989) Publisher: In the twenty-third century pioneers have escaped the crowded earth for life in self-sustaining orbital colonies. One of the colonies, Rotor, has broken away from the solar system to create its own renegade utopia around an unknown red star two light-years from Earth: a star named Nemesis. Now a fifteen-year-old Rotorian girl has learned of the dire threat that nemesis poses to Earth’s people — but she is prevented from warning them. Soon she will realize that Nemesis endangers Rotor as well. And so it will be up to her alone to save both Earth and Rotor as — drawn inexorably by Nemesis, the death star — they hurtle toward certain disaster. Nightfall — (1990) Publisher: These two renowned writers have invented a world not unlike our own — a world on the edge of chaos, torn between the madness of religious fanaticism and the stubborn denial of scientists. Only a handful of people on the planet Lagash are prepared to face the truth — that their six suns are setting all at once for the first time in 2,000 years, signaling the end of civilization! Child of Time — (1991) Publisher: Based on an Asimov short story, “The Ugly Little Boy”. A children’s nurse is hired as part of a scientific project aimed at bringing a living being from the past to the present. A four-year-old Neanderthal boy is snatched from his home and hurled 40,000 years into a terrifying future. The Positronic Man — (1992) Publisher: In a twenty-first century Earth where the development of the positronic brain has revolutionized the way of life, beloved household robot “”Andrew”” struggles with his unusual capacity for emotion and dreams of becoming human.